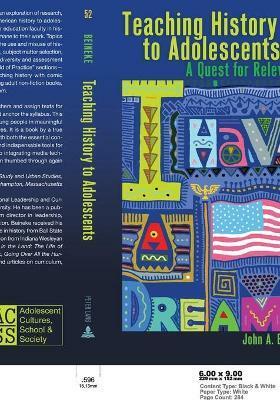 Teaching History to Adolescents: A Quest for Relevance is an exploration of research, ideas, trends, and practices for educators who teach American history to adolescents from the middle grades through high school. Higher education faculty in history and professional education will also find the book germane to their work. Topics within the field of teaching history to adolescents include the use and misuse of history textbooks, implementing primary sources into lessons, subject matter selection, professional development, technology, and the issues of diversity and assessment as directly related to history. The book includes "The World of Practice" sections - contributions from practitioners on topics such as teaching history with comic books, student engagement with public history, using young adult non-fiction books, and the role of controversial topics in the history classroom. John A. Beineke is Distinguished Professor of Educational Leadership and Curriculum and Professor of History at Arkansas State University. He has been a public school teacher, university administrator, and program director in leadership, youth, and higher education at the W.K. Kellogg Foundation. Beineke received his doctorate in social science education and a masters degree in history from Ball State University, and a bachelors degree in social studies education from Indiana Wesleyan University. He is the author of And There Were Giants in the Land: The Life of William Heard Kilpatrick (Peter Lang), a young adult book, Going Over All the Hurdles: A Life of Oatess Archey, and numerous chapters and articles on curriculum, educational policy, and the history of education.